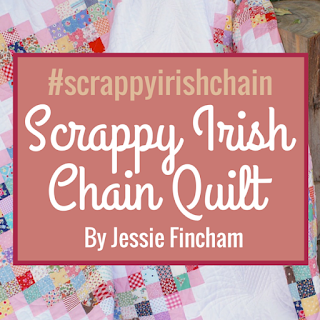 MessyJesse - a quilt blog by Jessie Fincham: The FINISHED Scrappy Irish Chain Quilt + FREE Downloadable Pattern! 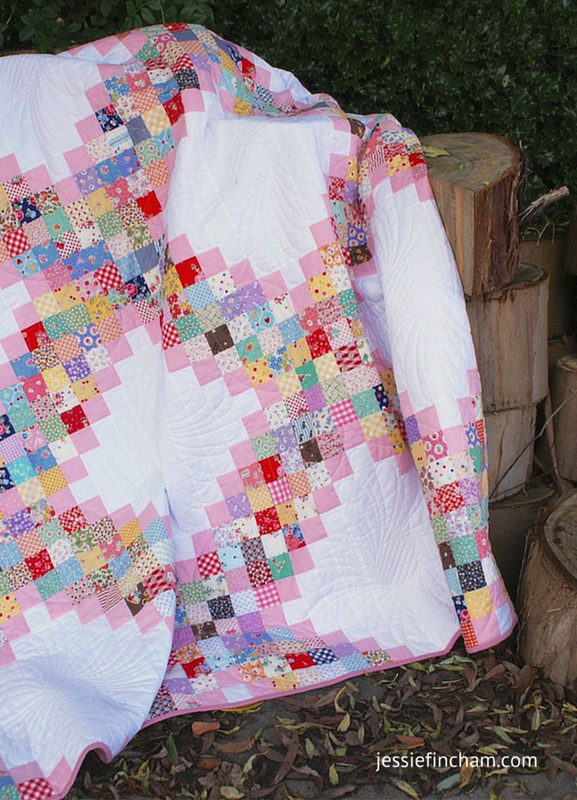 The FINISHED Scrappy Irish Chain Quilt + FREE Downloadable Pattern! I'm SO, so excited to share with you all my *finished! 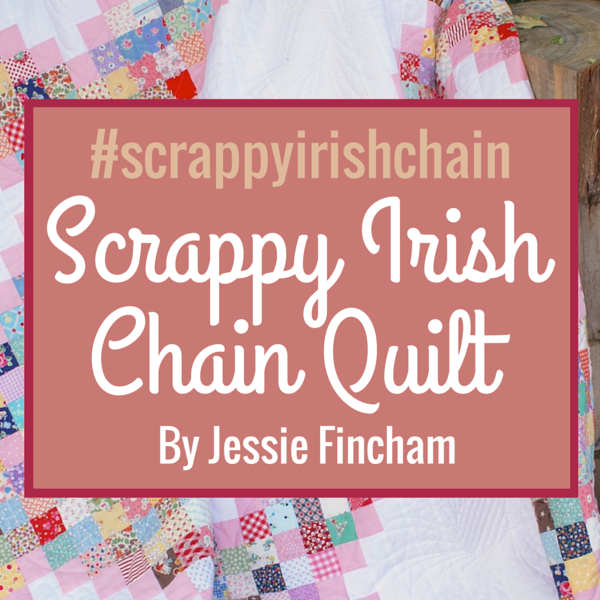 * Scrappy Irish Chain quilt! I've been waiting on this day a very long time. Too long in fact. Wow, I'm ridiculously happy to finally tick this one off the list and share with you! Long time readers might remember me posting the tutorial to make this along with my finished top waaaay back in March 2014, and starting on the quilt in January 2014! I finally had it quilted by Trudi Wood in July this year, finished just in the nick of the time for Festival Of Quilts in August. Trudi amazingly managed to squeeze it in her already huge schedule and I'm so thankful! Didn't she do a fantastic job! I knew this was far too big for me to handle, I just didn't have the space, energy, time or expertise (most importantly!) to quilt this mammoth 90" x 90" quilt! A job for the professional. I was also knee deep in preparations for the show so it made sense. I had it hanging in my Sew and Quilt booth at FOQ and it was just brilliant to receive so many lovely comments from people. Really, it was the cheering on I needed to keep me standing over the four days! I love having it on our bed now. That's the icing on the cake. Photographing this quilt was no small task I can tell you! It took a total of 3 different photography locations, 2 willing assistants, 1 chair and (almost) a few tears once I'd stained the back of it it from draping it over a rusty fence. Yep I know, it was a really clever idea by me. All in the name of blogging of course. Thankfully, I managed to get that stain off once we got home, phew. I knew I wanted to go with a traditional quilting style, so I asked Trudi for feathers and a grid work of sorts, so she came up trumps with some dreamy custom work. She used a looping variation in the chains, which works really well too. I couldn't make a decision on the binding right off, I auditioned several but in the end went for a solid as all the printed fabrics I tried looked far too busy. Kona Woodrose is slightly darker than the Kona Peony used in the chains, which works well to frame the quilt, I think. Can you believe I hand sewed the binding in one evening! OK, technically it was two as I still had a tiny bit to do the following morning, but it was almost one evening ;-) I think that probably goes to show how much I wanted to finish it! It's also my favourite part of quilting. I love being cosied under a big quilt, watching some good TV with a bit of hand-sewing in tow. That's my ideal night right there. So this is one B-I-G scrappy quilt! I raided my scrap bin to make the top, and I can't say it's made a dent because it's completely full again! I need another scrappy project, quick. Find the free Scrappy Triple Irish Chain quilt pattern here. Enjoy friends! I would be absolutely over the moon to see your versions! Please do respect my hard work in creating the pattern, please do not sell or redistribute my pattern. Instead link or direct people to my website, I would be ever so grateful. Thanks so much, happy quilting! Jessie. So pretty. I might be secretly plotting a Liberty Blue version...thank you so much. Uma obra de arte maravilhosa. Parabéns pelo seu talento bjs. I have no words for your quilt. It is just the most GLORIOUS thing I've ever seen, truly truly! I'm downloading the tutorial now, and hope that I could even come a teeny bit close to have a finished product like yours. Wonderful!! Beautiful! Don't mind at all. It's beautiful! A stunning quilt. Thanks so much for sharing and inspiring me to add this to my list! Beautiful!! And you should be so happy with that. Thanks for the download. Your quilt is so lovely. I love the lines of pink. A real beauty. looks great! i wouldn't have had the guts to use pink but i love the way it turned out. Amazing! The quilting is such a beautiful touch to this BEAUTIFUL quilt. Thanks for sharing. Really beautiful! Doesn't it feel great to have one done that was started so long ago!?!? Great finish!! 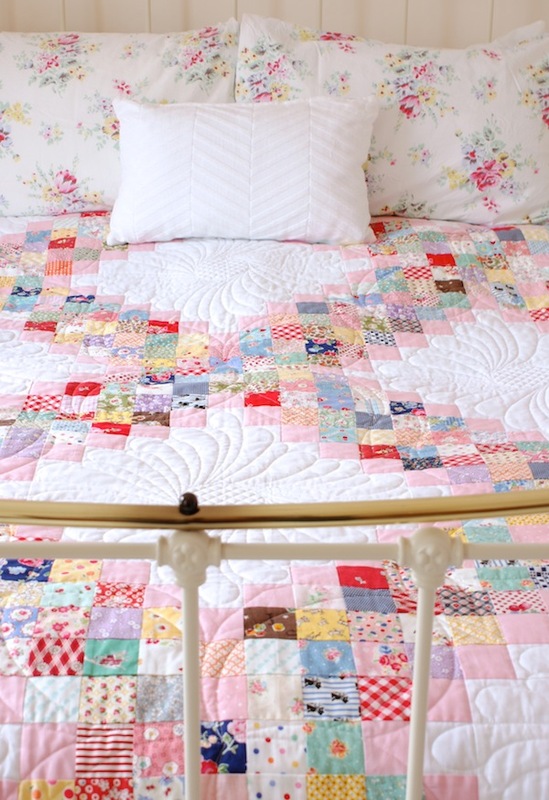 Beautiful quilt - thanks for sharing your pattern! That is very nice of you. I love that it is a scrappy quilt and I put it on my long to-do list! Love your blog too! Hi Jessie, the quilt is beautiful, I have put it on my to do list as I love it. I just need to live until I'm a hundred and fifty! 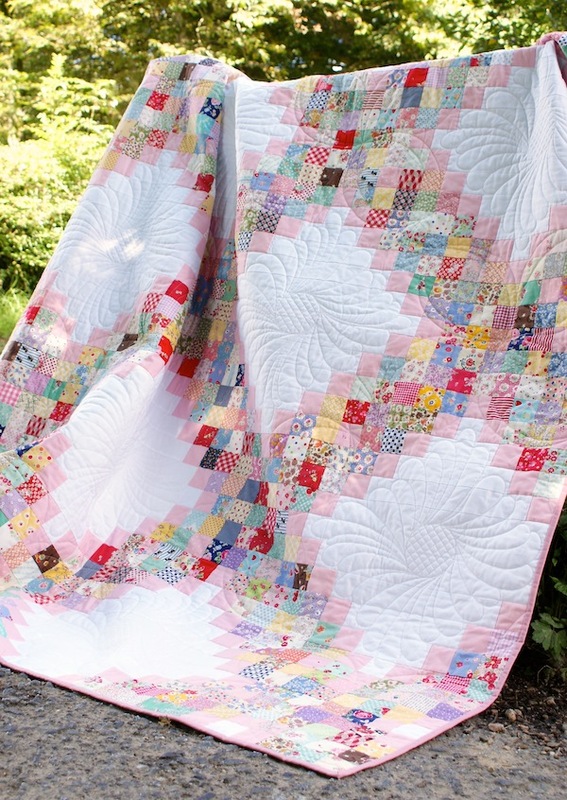 Gorgeous quilt and quilting, wonderful finish! 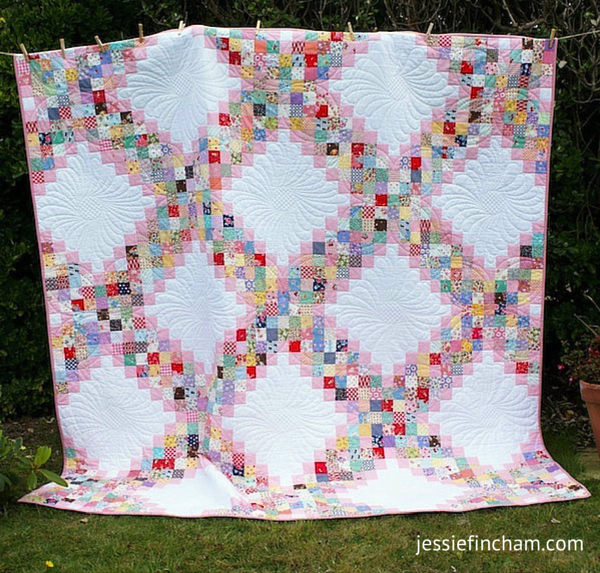 The quilting on this piece is absolutely Stunning J! The White blocks leap out at you but the Chain doesn’t disappear at all as the loops fit really well with the feathers. I loved the Yellow/White Irish Chain quilt you did, but this one is also fantastic. You have a gift for choosing and pairing up clean looking, classy fabrics. I bet this one will inspire lots of quilters. Love the Irish Chain, but the quilting is just as much of a stand out as the chain. Beautiful. Fabulous! I saw what Shelly's quilt guild dd in Missouri and had to follow her link over to see the original. The quilt is wonderful and the quilting is perfect for it. Beautiful job. Thank you for sharing your pretty simple piecing method. It can be overwhelming to piece this many scraps! So beautiful. I have made a triple Irish chain twice, but in the controlled 4 colors. I am looking for your scrappy pattern to kick it up a notch! Thank you so much!! This is an awesome and beautiful quilt. Lots of hard work. Wow! !